I would rather like to know if there is any character which could let me escape single quotes inside a chain? and find another quote symbol in dejavu font. That's a good question? I was just trying the English. I'll take the time to test thoroughly and report back on Saturday. down again after I installed a few scripts. I have found that yaf-splash can be tricky to gettext properly. yaf-splash -close box -fontsize large -bg orange -fb black -text " $(gettext 'Sorry. 'devx' file must be loaded.')" will make the script translate properly with MoManager. yaf-splash -close box -fontsize large -bg orange -fb black -text " $(gettext "Sorry. 'devx' file must be loaded.")" 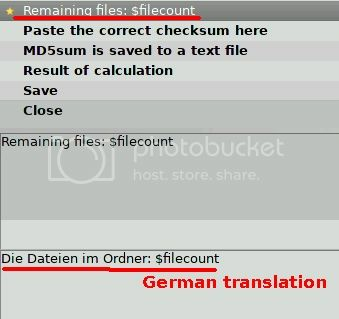 I checked the button labels with a German translation with MoManager. I did translations into German --> expressions with an apostrophe. Breakup a large amount ot text into lines of text. 3) Warning: Lines of Foreign language text are often longer than English. country Wizard , and run Momanager/Poedit. You can now do the translation into German. I didn't see your posts before although "Notify me when a reply is posted" was checked.